Michael Wickerson (right) shows a visiting artist one of two cupolas he’s built behind his home in Wyandotte County. Wickerson will host about a dozen sculptors from around the United States and Canada next week for an iron pour workshop. On a recent Saturday morning, Michael Wickerson was tending a hot fire in his backyard on a hillside near Wyandotte County Lake. At temperatures reaching as high as 2,700 degrees Fahrenheit, the fire was hot enough to melt iron. Wickerson, an associate professor of sculpture at the Kansas City Art Institute, said working with metal is a great joy for him. 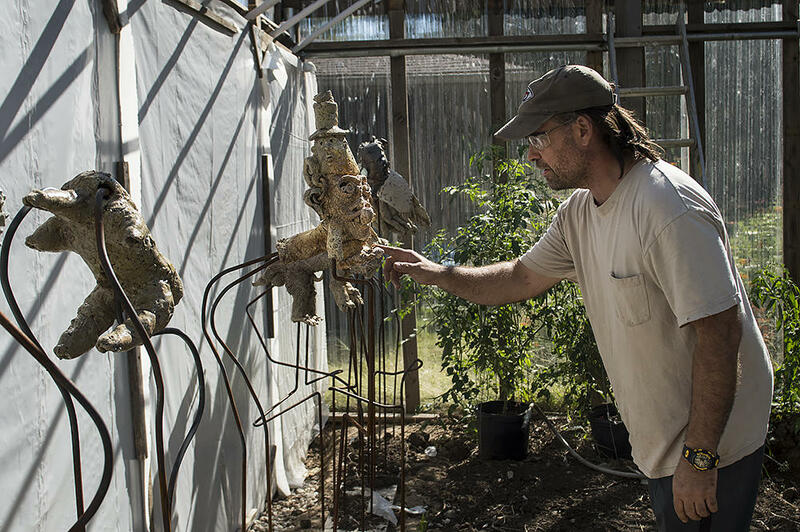 Wickerson adjusts a ceramic work in his greenhouse gallery. That's what a dozen or so artists from around North America and Canada will do when they visit his studio next week. From October 25-28, around 300 artists will gather in Kansas City for the International Sculpture Conference. They'll visit familiar places in the local arts scene, such as The Nelson-Atkins Museum of Art, the Crossroads Arts District and the Zahner Headquarters. A few will hop on a shuttle bus to Wickerson's sprawling, 14-acre complex for a two-day workshop on pouring iron. By the end of the weekend, each visitor will leave with an iron platter in a design of their own creation. Wickerson was preparing for their visit by building a six-foot tall firebrick and clay chimney on top of a railroad cart: a hand-built cupola, a blast furnace that runs off of coal and air. Heating it up helps remove residual moisture that might interfere with the burn. As the temperatures began to rise, Wickerson stoked his furnace with buckets of processed coal, or coke. Wickerson holds a handful of recycled cast iron and processed coal, also known as coke. Wickerson said an iron pour is a dramatic experience — an elemental display of the power of fire. Once the iron melts, or slumps, sparks begin to fly. Wickerson will tap an opening to allow the hot metal to escape. “It shoots like a stream and you have to catch it. The pressure of it is about 70 pounds,” he said, comparing that to 100 pounds of pressure in a typical garden hose. For Wickerson, the upcoming International Sculpture Conference is the perfect way to share his creative hamlet with other artists. In addition to workshop guests, Wickerson is hosting American sculptor Arann Schmidt and Polish-Canadian artists Wojtek and Ania Biczysko. Students from the Art Institute come and go on weekends. Wickerson said he likes to encourage them to come out and work on projects of their own. A group of students from the Kansas City Art Institute congregate around a woodfire kiln that Wickerson has named HERDRA. Art Institute student Levi Walker is planning to work as a foundry assistant during next weekend's workshop, filling molds and breaking up recycled cast iron. A senior in sculpture and art history, he said Wickerson’s studio and his land encourage exploration. 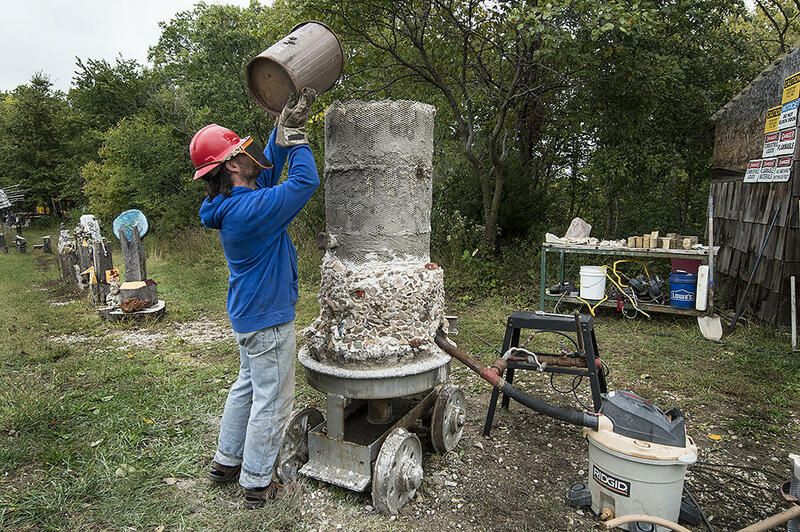 Carrying an armload of wood, Kansas City Art Institute student Rowen Foster helps feed a woodfire kiln. Rowen Foster, a senior in the sculpture department, frequently makes the drive to help Wickerson fire up his kilns. She said Wickerson’s open-air studio is a creative refuge from campus life. Wickerson might be just as inspired by his students as they are by him, said Annelise Kinney, a junior in the sculpture department. Wickerson stoked his furnace with buckets of processed coal. Each furnace Wickerson builds is a work of art in itself. Wickerson considers each furnace he builds to be a work of art in itself. After next week’s iron pour, the furnace will become a sort of monument in his outdoor exhibit. 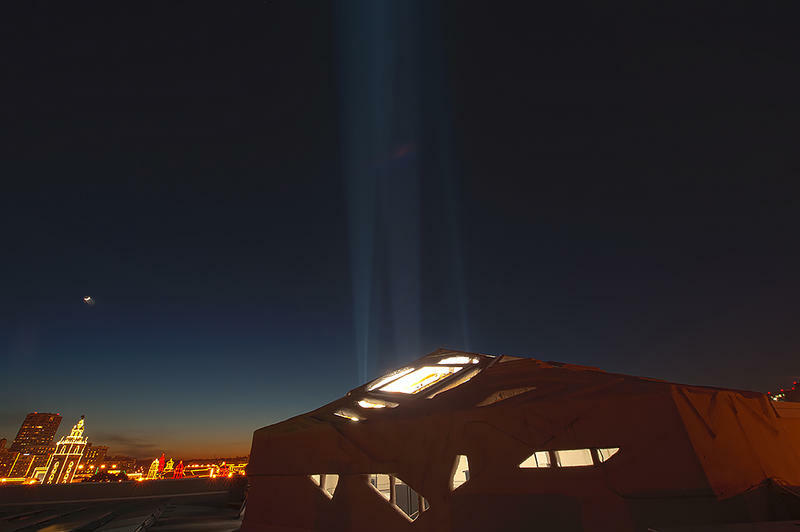 The installation called "The Steeple of Light" shines like a beacon from the rooftop of Community Christian Church at 4601 Main Street in Kansas City, Missouri. But the artist behind it is not as well-known. Sculptor Dale Eldred died in his West Bottoms studio during the 1993 flood, while trying to save his equipment from the rising waters. Since 1994, his "Steeple of Light" has illuminated the night sky. After a four-month absence, a 40-foot tall, 35-foot-wide, 24,000-pound aluminum sculpture by artist R.M. 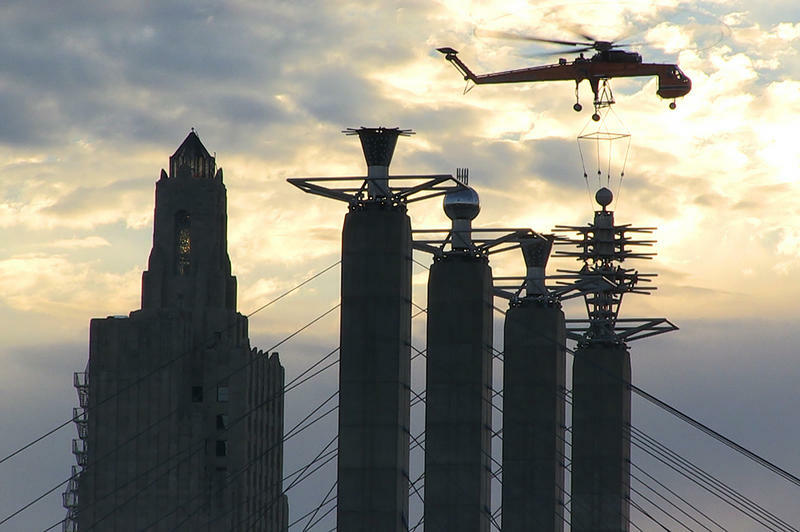 Fischer has returned to the top of its 300-foot-tall pylon at the Kansas City Convention Center.